Eyes Like Mine is an excellent psychological suspense novel. I loved it. The child Nora Watts gave up for adoption 15-years ago has vanished and the police are labelling her a chronic runaway. No one is looking for the girl, she’s not blonde or white enough. Once a starving artist herself, transient, homeless, left for dead in dark forest, Nora knows better than anyone what happens to girls that are lost to the streets. To the girls that the police don’t bother look for. Intuitive, not always likeable, and deeply flawed, Nora Watts is a new heroine for our time. Eyes Like Mine is Sheena Kamal’s debut novel. She was inspired to write it by the plight of missing and murdered indigenous woman in Canada – an issue that kept cropping up during her research for the Canadian TV documentary looking into missing and murdered women along a 724 kilometre stretch of highway in northern British Columbia. Everything about this book fascinated me from the characters and in particular the main character, Nora Watts, the gripping storylines that kept me racing through the book, to the atmospheric, gloomy setting in Vancouver and in beautiful British Columbia with its snow, mountains and plush ski resorts. The plot is intricate, complicated and fast moving, highlighting various issues such as mixed race inheritance and differences in treatment based on skin colour, homelessness, and environmental issues. These never overpower the story, but form part of the book as a whole. It’s narrated by Nora, in the first person present tense, interspersed by short chapters written in the third person, also present tense. I’m often irritated and distracted by the use of the present tense but I was hardly aware of it – I think it works well in this book, giving an insight into Nora’s mind and feelings. Nora is a conflicted character, a recovering alcoholic, who works as a receptionist and research assistant for Seb Crow and his partner, Leo Krushnik, who runs a private investigation firm. Nora’s speciality is that she can tell when people are lying. Nora lives in their office basement with her dog, Whisper. There are plenty of interesting and well-drawn characters and I liked Nora, despite her somewhat suspect actions, and Whisper, who also has her own issues. The main focus of the book is Nora, her traumatic background and her search for her daughter, Bonnie, now a teenager, who she gave away as a new-born baby. Nora is shocked by her reaction when she sees a photo of Bonnie – there is no doubt that she is her daughter, with her dark hair and golden skin. But it is her eyes that clinch it for Nora; Bonnie has the same eyes, dark and fathomless. And Nora feels as though she is in a nightmare. Nora, working for Leo is also searching also for the witness to a murder, who has since disappeared, and for the killer of an investigative journalist, Mike Starling, the man from her past who had been investigating corruption in the mining industry. Her search takes Nora into many dangerous and heart-stopping situations. I was almost breathless as I read Eyes Like Mine. 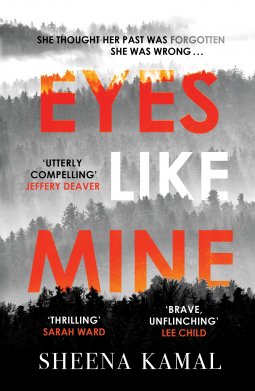 My thanks to the publishers, Zaffre, for an advanced review copy of Eyes Like Mine, to be published tomorrow, 9 February. I’ve been seeing this book around and definitely want to read it. The setting sounds like another character. And the story is appealing as well. Can’t wait. Glad you mentioned it! I’ll definitely keep an eye out for this one as it sounds like my kind of thing. Fascinating background and setting to it. Excellent review, Margaret. This sounds like a book I would like since I read thrillers and this has a different twist including the missing young woman being of indigenous background. I’m not usually one for the present tense, either, Margaret. But the story itself really sounds so intriguing! And knowing the background/inspiration makes it even more so.